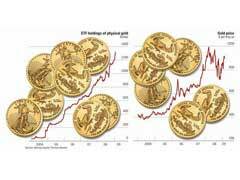 If you are looking for a long term gold bullion investment but are not willing to incur additional costs associated with storage of physical gold in form of gold coins or gold bullion bars, consider buying into gold bullion securities. One share of gold bullion ETF generally represents one tenth of an ounce of physical gold. The first gold bullion security was founded in 2003 and now there are lots of similar gold bullion securities that are distinguished by a separate gold bullion ticker. A gold bullion ticker is a special symbol that helps gold investors to tell one gold bullion security from another. All gold ETF’s are exchange traded funds that are openly traded on major stocks exchange like NYSE, AMEX and NASDAQ. The first portion of the gold bullion ticker stands for the stock exchange it’s traded at. The next sequence of symbols will represent a gold bullion fund itself. For example, let’s look at the following gold bullion ticker symbol like NYSE: SGOL, it stands for Physical Swiss Gold Shares that are traded at New York Stock Exchange, and is an exchange traded fund that exclusively stores physical gold in Switzerland. It’s important to research all gold bullion securities before you decide to invest into their shares. Call them to find out where they are headquartered and which location is used for storing physical gold. You definitely want to stay away from gold bullion securities located in countries with unstable political or economic environment to safeguard your investment. Gold bullion ticker funds are directly correlated with gold bullion price today by going up when gold spot price is on the rise and vice versa. Gold futures are another type of gold investment mechanism that are not dealing with physical gold but with fulfillment of gold contracts at certain terms and are based mostly on gold price speculations.